Home >> Blogs >> What Would Life Be Like…#ifihadapairofgoogleglasses ? What Would Life Be Like…#ifihadapairofgoogleglasses ? Are they just a pair of Glasses? 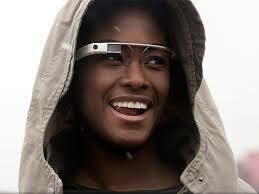 Google Glass as a Pair of Glasses! I just read an interesting article, one of the many that has been popping up over the past month or two relating to the new Google Glass, the most recent and probably to date, the most advanced proposition for a real “wearable computing” solution. I have to admit some confusion regarding the name, for some reason I appear to refer to Google Glass continuously in the plural, mainly because it bears at least a material resemblance to the existing wearable AT solution that sits on the bridge of my nose! Google Glass is not available as a product yet, (and of course neither are “Google Glasses”) although it seems like people have been talking about it for quite a while. In fact applications for Google Glass, according to their website have closed, http://www.google.com/glass/start/how-to-get-one/. With announcements for their early adopter program due shortly and the promise of a consumer model late in 2013. The article by Natasha Lomas (http://techcrunch.com/2013/03/31/glass-explorer-apps/) presents a great update on the project as a whole and presents a digest of some of the many ideas posed by applicants to the Google Glass Explorer Program, a process running in early 2013 for anyone who wanted to apply requiring them post their proposed innovations on Google+ or Twitter consisting of 50 words or less, featuring the hashtag #ifihadglass. One can only assume that this privileged community of, rumor has it, 1500 people will become the new pioneers in the next generation of mobile or wearable technology solutions. Google Glass is a wearable computer with a head-mounted display (HMD) that is being developed by Google in the Project Glass research and development project, see the Wikipedia entry for further information Google_Glass . I also wonder if the 007 nature of such technology coupled with the fact that it is being developed in somewhere called “Google X Lab” alongside a “driverless car”, has added to the hype about it? Since talk about Google Glass has been doing the rounds for longer than the Apple Watch, it despite all of the talk and hype, there is nothing for the public to judge beyond sound-bites and speculation. However, as blogs are a natural home for speculation – we will indulge ourselves here with some speculation as to what Google Glass might mean for people with a disability or the accessibility community. Often we are witness to new revolutions in technology leaving people with a disability floundering in its wake, or disenfranchised in the enthusiasm of the latest and greatest trend. Does anyone from the blind community remember the launch of the Graphic User Interface – or going back further, how long it took for members of the Deaf Community to make up for ground lost by Bell’s groundbreaking “telephone”? In her article, Natasha Lomas compiled a list of the app ideas that Glass winners are pledging to create, interestingly there are several potential applications for People with a Disability or otherwise improve the accessibility of the ICT landscape. Think about applications for use with kids and learning disabilities. It was heartening to see the list of potential apps that might be created for people with a disability, particularly after watching the promotional video which appears on the “How It Feels” section of the Google Glass website http://www.google.com/glass/start/how-it-feels/ (how accessible is that? ), which would suggest that this revolution in wearable technology is nothing other than a home movie camera for families and adrenalin junkies. So many of the ideas posed relate to solutions for People who are Deaf or Hearing Impaired, curious that developers obviously see potential in a technology that clearly looks like its for people with low vision, to be transformed into a device that helps deaf or hearing impaired people communicate. For those, like me, who were neither brave enough or organized enough to submit my ideas in 50 words or less using the hashtag #ifihadglass – I now offer the opportunity to post your speculations as to what the “killer” APP for the Assistive Technology or Accessibility communities will be right here. For people with Dyslexia: An App that highlights each word as the person moves their eyes over text or documents and used text to speech to “read aloud” for the person. · For adults with low vision: An App that magnifies text to a selected font size, and renders this in the person’s field of vision. This would be particularly useful for older people who struggle to read the prices or information on labels when shopping. · For people with restricted mobility: An app that allows environmental control via eye gaze (if eye gaze technology can be scaled to such a degree). Allowing a person with limited mobility to look at an object and change its state (on/off etc.) would be a huge step forward from the current switch and scanning solutions currently available. · For Young Adults with a Learning Disability: An APP that could act as a “travel partner”, assisting young adults with cognitive disabilities with learning how to travel or take transportation independently. · For Children with Communication Disabilities: An APP that provides text to speech feedback for objects a child is looking at, providing an opportunity for a parent or therapist to gain better insight as to the child’s ability to eye-point to objects in his/her environment. Although the main challenge would be to stop the child from continuously taking the high tech specs off!!! Anyway – this is just for starters. I, for one, am not sure if the final Google Glass that we will eventually see, will live up to expectations. It is easy however, to sit on the sidelines and remain skeptical, instead it’s a lot more productive to :imagine”. With that thought in mind, I would love to hear anyone else’s speculations about what Google Glass might offer people with a disability. Tweet it, share it, blog it – it certainly makes for some interesting thinking and conversations!